I am an associate professor at the Department of Education in Seoul National University, Seoul, South Korea. I like to play with new technologies, design meaningful learning activities, and investigate how people learn in online learning environments. I believe that people construct their knowledge through active interaction with teachers, peers, and objects. Recently, my research interests include computer-supported collaborative learning, problem-based learning environments, mobile seamless learning, and virtual learning communities. I often work with researchers in other domains like STEAM education, public health, and computer science. Ph.D. in Information Science and Learning Technologies, 2011, University of Missouri (MU), U.S.A.
조규락, 조영환 (편). (2019). 문제해결과 학습 디자인: David H. Jonassen 교수님의 연구를 되돌아보며 [Problem solving and learning design: Essays in honor of David H. Jonassen]. 서울: 학지사. Lim, C., Cho, Y. H., & Kim, S. (2016). Partnerships and innovation for blended learning at Seoul National University, Republic of Korea. In C. P. Lim, & L. Wang (Eds. ), Blended learning for quality higher education: Selected case studies on implementation from Asia-Pacific (pp. 211-233). Bangkok: UNESCO. 곽덕주, 강대중, 박현정, 소경희, 이선영, 정동욱, 조영환 (2016). 미래교육, 교사가 디자인하다 [Teachers design future education]. 파주: 교육과학사. Cho, Y. H., Caleon, I. S., & Kapur, M. (Eds.). (2015). Authentic problem solving and learning in the 21st century: Perspectives from Singapore and beyond. Singapore: Springer. Ng, Z. Y., Tay, W. Y., & Cho, Y. H. (2015). Usefulness of peer comments for English language writing through web-based peer assessment. In G. Chen, V. Kumar, Kinshuk, R. Huang, & S. C. Kong (Eds. ), Emerging issues in smart learning (pp. 385-392). Berlin: Springer. Cho, Y. H. (2015). Collaborative learning and 21st century skills. In J. M. Spector (Ed. ), The SAGE encyclopedia of educational technology (pp. 128-131). Thousand Oaks, CA: SAGE. Cho, Y. H., & Hong, S. Y. (2015). Mathematical intuition and storytelling for meaningful learning. In K. Y. T. Lim (Ed. ), Disciplinary intuitions and the design of learning environments (pp. 155-168). Singapore: Springer. 이영주, 조영환, 조규락, 최재호 공역 (2014). 테크놀로지와 함께하는 유의미학습 [Meaningful learning with technology]. 파주: 아카데미프레스. Jonassen, D. H., & Cho, Y. H. (2008). Externalizing mental models with mindtools. In D. Ifenthaler, P. Pirnay-Dummer, M. Spector (Eds. ), Understanding models for learning and instruction: Essays in honor of Norbert M. Seel (pp. 145-160). Springer: New York. 정석훈, 한예진, 모윤하, 손미현, 정대홍, 조영환 (2019). 실제적 맥락을 적용한 중학교 과학 탐구 학습이 학습자 질문 수준에 미치는 영향 [The effect of authentic contexts on learners' questioning level in science inquiry learning at middle school]. 학습자중심교과교육연구, 19(2), 1299-1323. 손미현, 조영환, 정대홍 (2018). 어포던스 관점에서 살펴본 디지털 탐구도구의 역할과 특징: 과학탐구 활동 사례를 중심으로 [Role and characteristics of digital inquiry instruments in respect of affordance: Focused on science inquiry activity]. 현장과학교육, 12(2), 274-286. 백종호, 정대홍, 조영환 (2016). 과학탐구와 디자인 융합교육 프로그램 개발: 부력의 원리와 수영복 만들기 [Development of convergence education program for scientific inquiry and design: Buoyancy principles and swimsuit design]. 현장과학교육, 10(2), 182-194. 조영환, 황매향, 김윤강, 김명섭, 홍서연 (2015). 3차원 가상세계를 활용한 학교폭력 문제해결 활동의 효과와 개선점: 활동이론을 적용하여 [Effectiveness and weakness of school-bullying problem solving activities in a 3D virtual world: Application of activity theory]. 교육과학연구, 46(4), 71-97. 조영환, 김윤강, 황매향 (2014). 3차원 가상세계 역할놀이를 통한 초등학교 예비교사의 문제해결력 증진 방안에 관한 사례연구 [A case study on 3D virtual role play for improving problem solving skills of elementary school pre-service teachers]. 교육공학연구, 30(1), 45-75. 박성익, 조영환 (2005). 문제의 구조화수준과 표면유사성이 유추전이에 미치는 효과 [The effect of problems’ structuredness and surface similarity between source problems on analogical transfer]. 아시아교육연구, 6(2), 71-94. 임철일, 조영환, 장선영, 하미리 (2005). 사용자중심설계 모형에 관한 개발연구: 웹기반 문제중심학습을 중심으로 [A developmental study on the user-centered design model for developing online problem-based learning environments]. 교육학연구, 43(3), 231-263. 조규락, 조영환, 김미경, 성봉식 (2004). Goal-based Scenarios (GBS) 모형을 적용한 웹기반 교육용 컨텐츠의 설계 및 개발연구 [Design and development of WBI contents: A goal-based scenarios model]. 컴퓨터교육학회 논문지, 7(5), 9-21. 조영환, 김관훈, 한정윤 (2019). 학습분석 기반 적응적 협력학습 지원에 대한 학습자의 인식 [Student perception of adaptive collaborative learning support through learning analytics]. 교육정보미디어연구, 25(1), 25-57. 임혜숙, 조영환 (2017). 음악실기교육에서 성취목표지향성과 그룹연습이 학습자의 만족도와 자기효능감에 미치는 영향 [The effects of achievement goal orientation and group practice on student satisfaction and self-efficacy in music performance education]. 음악교육연구, 46(4), 129-152. 조영환, 설보연, 이현경, 강다현, 조애리 (2017). 클라우드 컴퓨팅 기술을 활용한 협력적 문제해결에서 자기조절과 그룹조절 활동 탐색 [Exploring self-regulation and group-regulation in collaborative problem solving with cloud computing technology]. 교육정보미디어연구, 23(3), 345-371. 이현경, 조영환, 강다현, 설보연 (2017). 컴퓨터 기반 협력적 문제해결에서 그룹조절 활동에 따른 군집별 학습과정과 결과 [Learning process and outcomes of group regulation clusters in computer-supported collaborative problem solving]. 교육공학연구, 33(3), 625-652. 옥미례, 조영환, 허선영 (2016). 초등 디자인 교육에서 동료평가를 위한 학습자 지원전략 개발 및 적용 [The development and application of learner support strategies for peer assessment in elementary design education]. 교육과학연구, 47(2), 23-52. 조영환, 박현정, 김정연, 석유미, 이신혜 (2015). 온라인 토론 촉진을 위한 피드백의 역할 탐색[Exploring roles of feedback to facilitate online discussion]. 아시아교육연구, 16(2), 289-313. Cho, Y. H., Ding, N., Tawfik, A., & Chávez, Ó. (2014). Computer-supported collaborative concept mapping for learning to teach mathematics. Journal of Applied Instructional Design, 4(1), 21-33. 조영환, 홍서연, 이정은 (2014). 예비교사를 위한 3차원 가상세계 역할놀이에서 학습자 간 상호작용에 관한 탐색적 연구 [An exploratory study on learner-to-learner interaction in a 3D virtual role-play for pre-service teachers]. 교육정보미디어연구, 20(1), 27-50. Park, Y., Sung, J., & Cho, Y. H. (2017). Exploring online learning profiles of in-service teachers in a professional development course. Educational Technology International, 18(2), 193-213. Rha, I., Lim, C., Cho, Y. H., Choi, H., Yun, H., Yoo, M., & Jeong, E. (2017). Developing a national data metrics framework for learning analytics in Korea. Educational Technology International, 18(1), 1-25. 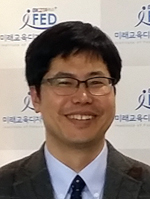 조영환, 허선영, 최효선, 김정연, 이현경 (2015). 고등교육 분야 온라인 학습 연구의 동향: 생태계적 접근 [Research trend of online learning in higher education: an ecological approach]. 교육공학연구, 31(4), 725-755. 박성익, 조영환 (2005). 원격교육매체에 대한 학습자의 인식 분석: 다차원 척도법을 적용하여 [Learners’ perception of distance education media: Using multidimensional scaling methods]. 열린교육연구, 13(2), 115-137. 성지현, 조영환, 조규태, 허선영, 양선환 (2017). 학습자 중심 교육에서 디지털교과서의 역할 탐색 [Exploring the roles of a digital textbook in learner-centered education]. 교육정보미디어연구, 23(4), 831-859. Suk, Y., Cho, Y. H., & Jeong, D. H. (2017). Profile analysis of elementary school students' smart device usage. Educational Technology International, 18(1), 27-47. 이창윤, 조영환, 홍훈기 (2015). 감성측정 테크놀로지의 교육적 활용방안 탐색 [Educational use of emotion measurement technologies]. 한국콘텐츠학회논문지, 15(8), 625-641. 최효선, 조영환, 유명순 (2014). 건강증진 메시지 디자인 원리의 중요도와 실행도에 관한 탐색적 연구 [An exploratory study on the importance and performance analysis of health message design principles]. 한국콘텐츠학회논문지, 14(6), 307-318. 조영환, 최효선, 유명순 (2014). 핵심정보 중심 건강 메시지 디자인을 위한 웹진 내용분석 [Content analysis of webzine for gist-based health message design]. 한국콘텐츠학회논문지, 14(2), 192-204. 심민선, 조영환, 최효선, 손희정, 주영기, 유명순 (2013). 핵심정보 중심의 건강증진 및 보건교육 메시지 구성 원리 [Gist-based message design principles for health promotion and public health education: Explication of Fuzzy Trace theory]. 보건교육건강증진학회지, 30(5), 189-199. 박나실, 우한솔, 박유진, 장도현, 조영환 (2017). 교사의 인문적 역량에 관한 요구도 조사 [A study on teachers' needs of humanistic competences]. 한국교원교육연구, 34(3), 201-219. 박세준, 성지현, 최상복, 이윤식, 곽봉종, 황진숙, ... 조영환 (2017). 미래 핵심역량 기반 수업실천에 대한 교사의 군집유형별 특성과 교사교육에 관한 요구도 [The differences of teachers' characteristics and professional development needs according to cluster types based on instructional practice for future core competencies]. 교육정책연구, 1(2), 135-157. 김지현, 조해리, 조영환, 정대홍 (2018). 과학담화에서 과학자와 중학생의 제스처 비교: 분자운동과 물질의 상태변화를 중심으로 [The difference of gestures between scientists and middle school students in scientific discourse: Focus on molecular movement and the change in state of material]. 한국과학교육학회지, 38(2), 273-291. 신종호, 조영환, 이규민, 이현주 (2006). 신경과학, 교육심리, 인지심리 연구를 통해 본 뇌기반 교육의 타당성 [Study on the validity of brain-based learning evaluated through research in educational psychology and cognitive neuroscience]. 아시아교육연구, 7(4), 87-109.